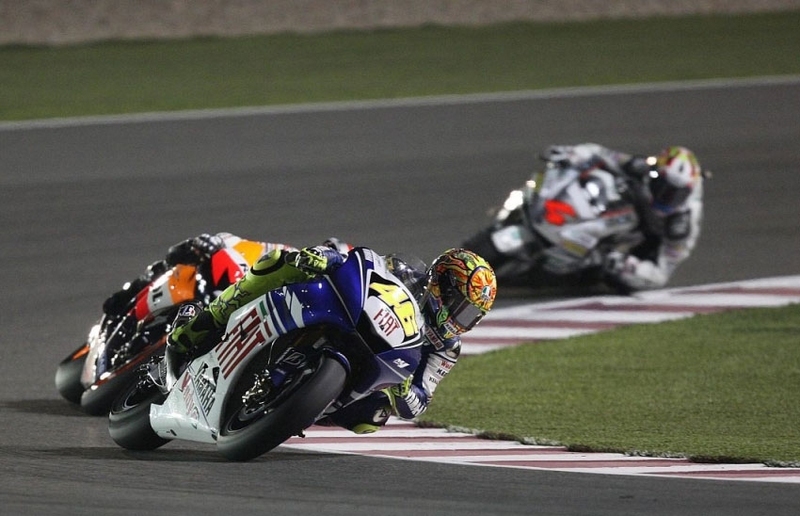 The Moto GP season is off to a terrific start, with rookies up front, new bike and tire combinations coming good (or not), and good close racing down the field in spite of the oddness of racing under the lights at 11 p.m. local time in Qatar. The first few laps of the Moto GP race were quite atypical, looking more like a 125 shove-fest, as eventual winner Casey Stoner pointed out in the post-race press conference: "That was a fantastic race and I really enjoyed it — it was like being back in 125s! The first few laps were really hectic, there were guys bashing fairings and I just tried to stay out of the way." Most brutal move was a pass that Moto GP rookie (albeit twice WSB champion) James Toseland put on Jorge Lorenzo; the two definitely hit but there were no hard feelings afterwards. Toseland said, "I put a move on Jorge that was quite close. That’s just a lack of experience racing against these guys … Jorge put his bike over my nose just as I was committed for the pass. I’ve just got to get used to how these guys take the corners so I can pass them a bit safer. But he left the door open a bit and I went for it. There was no harm done." Lorenzo agreed, saying he had done the same thing more than once and offering the opinion that James was "a good guy." We may have to recalibrate our opinion of Spanish GP riders being actual human beings … well, except Pedrosa, of course. Once the initial excitement settled down a bit, with Dani Pedrosa the surprise leader after an unbelievable start from the third row, Stoner calmly picked his way to the front and that was basically all she wrote as far as the winner went; he took over the lead at about half-distance, put down a series of lap records, and that was that. Stoner, Lorenzo, and Pedrosa strung things out a bit from first to third, but the dogfight for fourth was excellent up to the flag. Valentino Rossi got jammed quite rudely by Andrea Dovizioso (another Moto GP "rookie") on the second-last lap, and Toseland nearly got by as well, with his Tech 3 team-mate Colin Edwards not far off the pace. Edwards was shaking his head after the race, with his high hopes from third-place qualifying dashed: "I didn’t leave anything out there tonight. If you paid me a million dollars I couldn’t have gone any faster. I was riding my hardest but at the end of the day it just wasn’t fast enough and to be honest I’m not sure why." There was lots of disappointment farther down the field. The Kawasaki and Suzuki teams had a horrible weekend; on the Rizla Suzuki side, Chris Vermeulen had a front tire problem and had to pit for a change, basically ending his race, while team-mate Loris Capirossi was a distant eighth behind Edwards. On the green side of the ledger, John Hopkins could only manage 12th after his still-healing groin muscle tear made itself felt: "… at about half race distance, the performance of the front tire went off, and it started sliding in the turns. I had no option but to hold the bike up on my knee, but that put a lot of pressure on my injury. The pain built up very quickly, and by two-thirds distance it was excruciating. If it had just been pain then I could have ridden through it, but in the end I simply ran out of strength in the injured muscle, and I just couldn’t maintain my lap times." At that he was happier than his team-mate Anthony West, last except for Vermeulen and frankly bewildered as to why he was so slow all weekend. Somebody else who was seriously upset was ’06 world champion Nicky Hayden, who managed only a 10th after opting to use the 2007 bike rather than the ’08 machine (team-mate Pedrosa used the new one). That was bad enough, but to also be beaten by customer Hondas under Moto GP rookie Andrea Dovizioso and new Honda recruit Randy de Puniet must have hurt. "It wasn’t pretty for sure," the American said. "We got beat bad today so we’ve obviously got a lot of work to do. I got a decent start but I couldn’t push the way I wanted to, couldn’t be aggressive and couldn’t make anything happen, so I kinda went backwards then I went forward again. I was spinning a lot, which definitely didn’t do the rear tire any favours, I really think we just missed the set-up and worked the tire way too hard." Caption for Rossi’s photo should read “5th”, as in: “after the race Rossi had a fifth to drown his disappointment.” It’s going to be a long season for the double ex-Champ, unless of course someone manages to strap a boat anchor to Stoner’s Ducati.